Today, with student numbers at more than 24,000, the university continues to emphasise professional experience alongside academic study, with all students given the opportunity to undertake work placements and sandwich courses. Around 70% of Huddersfield students gain a professional qualification alongside their main degree and many courses also include a new language as an extra module. Aided by strong industry links, Huddersfield also prides itself in being a leader in the field of enterprise. It supports self-starters and was awarded with the THE Entrepreneurial University of the Year award in 2012. Its new, state-of-the-art 3M Buckley Innovation Centre promotes innovation and collaboration between students, faculty and local business start-ups. Overseas study opportunities are available to students within Europe and further afield via Huddersfield’s partnerships with Hong Kong Polytechnic University and SUNY (State University of New York), among others. The university comprises seven academic schools and is located in Huddersfield town centre, alongside the picturesque Narrow Canal and tree-lined towpath, old bridges and converted mills. It recently opened Student Central, a new £22.5m development that brings together learning and leisure facilities under one roof. 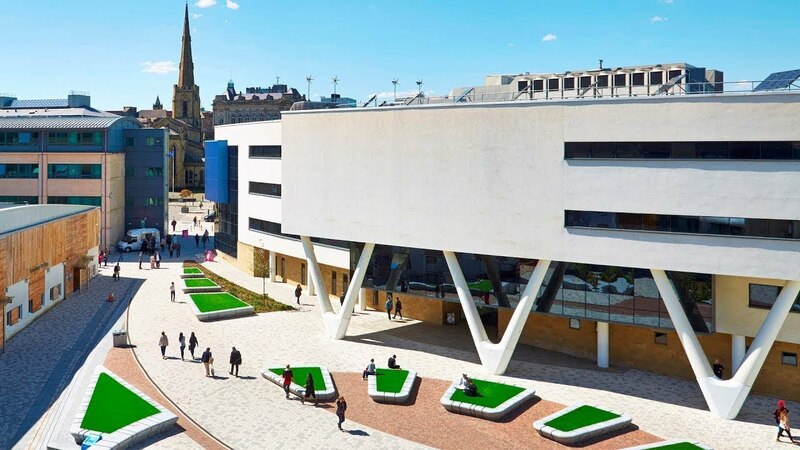 With a lower cost of living compared to other parts of the UK, Huddersfield is a popular student destination. Mid-way between Leeds and Manchester, it offers easy access to two major northern cities as well as the great outdoors. The Peak District National Park is also within easy reach, which offers activities such as hiking, rock climbing, caving, sailing, quad biking, horse riding and more. Alumni of the university include the politician Lord David Blunkett, BBC Breakfast presenter Sally Nugent, the actor Rob James-Collier who played Thomas Barrow in Downton Abbey, and Adil Ray, who co-writes and stars in Citizen Khan. Begin your journey to a successful career at the International Study Centre. Our pathway programmes will prepare you for the challenges of degree-level study in the UK, providing you with the academic knowledge and English language skills needed to succeed at the University of Huddersfield. Whether you are interested in creative arts, computing, engineering or business, there is a course at the International Study Centre to suit you. Each programme will raise your academic skills, English language level and study skills to help you prepare and progress to your chosen degree. Prepare for your undergraduate degree in a three-term programme that will develop your academic knowledge, study skills and English language skills. An intensive, three-term programme designed to develop your skills and prepare you for the second year of your undergraduate degree.